A Train to Busan Remake is officially in the works and it has become subject to a bidding war between several major studios. Not only was the South Korean zombie flick a huge hit, positioning it as something Hollywood was destined to do an English language remake of at some point, but James Wan, the man behind The Conjuring universe, and IT writer Gary Dauberman are now attached to the remake. As such, this is a project that has money written all over it. According to a new report, New Line, Universal, Paramount, Lionsgate and Screen Gems are all in the mix for the Train to Busan remake. The package is expected to sell this week for an undisclosed seven-figure sum. There is no word on who may wind up in the director's chair or how soon production could get off the ground, but it doesn't sound like this is the kind of thing that will just sit on a shelf collecting dust. Whoever wins this bidding war is going to want to get this project moving in the right direction. 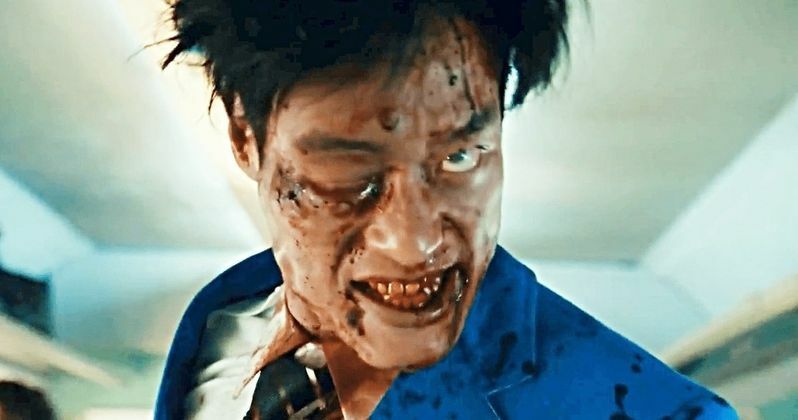 Director San-ho Yeon, who is currently working on Train to Busan 2, helmed the original to great success, with the movie earning $85 million worldwide. Only $2 million of that came from the U.S., which is typically where the lion's share of a movie's box office will come from. Not to mention that Train to Busan, which centers on a group of passengers who try to survive a deadly train ride from Seoul to Busan during a zombie outbreak, currently sits at a 96 percent approval rating on Rotten Tomatoes. It's got critical acclaim, an interesting premise and proven box office potential to go along with an already promising creative team. James Wan, as a director, helmed the two main chapters in The Conjuring series, as well as Furious 7 and the upcoming Aquaman for Warner Bros. He's also produced a ton of horror movies and has become a name closely associated with success. The same can be said of screenwriter Gary Dauberman who, despite not always hitting it out of the park with critics, writes movies that make money. IT was a ridiculous hit for Warner Bros. and New Line last year and, despite critical disapproval, The Nun has done big business so far. Dauberman also penned the script for next year's IT: Chapter 2, Annabelle and the upcoming Are You Afraid of the Dark? movie adaptation. They seem like the perfect pair for a Train to Busan remake. But can they get the right director to bring this story to American audiences while retaining what made the original so great? It's going to be a fine line to walk, but it's off to a promising start. We'll be sure to keep you posted as new details on the project are made available. This news was first reported by Deadline.